Experience two of the Yucatan’s top destinations with a pair of day trips from the Riviera Maya, saving money by booking both together. 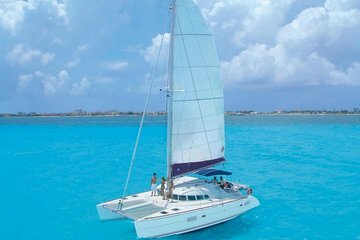 First, spend a day at Xcaret Park, exploring the nature and wildlife of the family-friendly resort, then sail to Isla Mujeres by catamaran, stopping to swim, snorkel, and see the island along the way. With the option to add lunch and drinks at Xcaret, this two day combination tour includes hotel transfers from selected areas, admission, and activities, as well as an open bar and buffet lunch in a private, Isla Mujeres beach club.